I can’t believe I almost forgot to re-post this very important Christmas recipe. I had a couple of grim years where there was no trifle for me as we couldn’t find a gluten free sponge that would stand up to soaking in sherry and being submerged in jelly. Proper old school trifle is my favourite desert, I don’t know why exactly but it ticks all the boxes required in a sweet to make me sigh contentedly as I reach for a second helping. Chiffon cake is great to make with Gluten Free Flour and is the closest thing I can find to the sweet, light, dry trifle sponges that we bought and used every year for Christmas Trifle. Trifle is the one Christmas food tradition I could not do without, steeped in sherry, set in proper jelly and topped with custard and then a layer of whipped cream it is the perfect desert to follow Christmas dinner. This quantity will make enough for two trifles and as the sponge freezes beautifully you can make it well in advance of Christmas Day. If you don’t feel like making two trifles use the second half of the sponge for Tiramisu, I guarantee it will be delicious. Preheat the oven to Gas 4/ 180 /350°F. • Sift the Gluten Free plain flours, 1 1/4 cups of the caster sugar, baking powder and salt together twice into a large bowl. • In a separate bowl, beat the egg yolks with the water, oil, and vanilla until smooth. • Add the egg batter in to the flour mixture and fold in until smooth. • In a clean dry large bowl whisk the egg whites to the soft peak stage, then add the remaining 1/4 cup sugar, continue beating but stop before you reach the stiff peak stage or your cake will shrink. • Use a rubber spatula or large flat spoon to fold one-quarter of the egg whites into the cake batter to loosen it slightly, then gently fold in the remaining whites , be gentle but keep going until there are no streaks of egg white visible. • Pour the batter into the lined roasting dish. • Bake for forty to fifty minutes until the top springs back when lightly pressed and a cake tester inserted in the centre of the cake comes out. In my house there are a few traditions around the trifle. The trifle and custard are usually made by my brother who is so precious about this desert that he makes it himself just to make sure the job gets done. The process often begins after Midnight Mass and a few festive tipples, if he has one tipple too many then my Mum will step up. The trifle is made with two packs good old fashioned Birds Raspberry or Strawberry jelly, dissolved as per the instructions on the packet. The sponge is sliced in to inch wide fingers, split and sandwiched back together with jam. 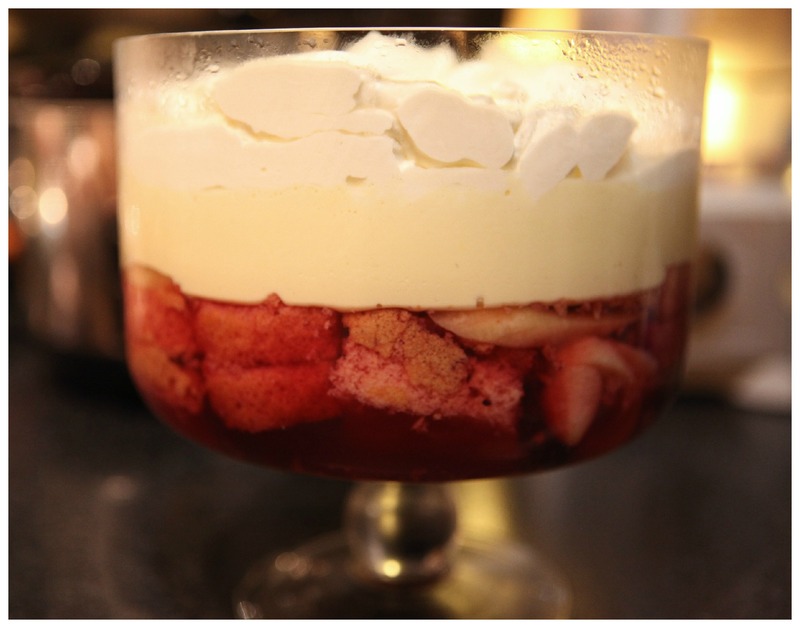 The jammy fingers are dipped in to a saucer of sherry and then layered in the trifle bowl with two sliced bananas. The dissolved jelly is poured over the sponge and the trifle is left to set. While the trifle is setting it is time to make the custard, if you do not feel like making your own custard there are plenty of good pre made gluten free custards on the market. Once the trifle has set and the custard cooled, pour the custard over the trifle and place in the fridge until you are ready to serve. Just before serving whip some cream to soft peaks and dollop over the surface of the trifle. Cold, soft and sweet this desert is perfect after a heavy Turkey and Ham dinner with all the trimmings and although I do love a traditional Christmas Pudding I prefer to leave that for a late evening treat to enjoy while watching a Christmas Movie in front of the fire.